Thank you to all our cable TV customers who responded to our recent request to share your feelings with us regarding the local networks and costs associated with keeping both the Idaho and Utah affiliate networks. We had a good sample of our customers complete the online survey, and we appreciate those who, even though they didn’t have internet access, still took the time to respond via letter, email, or phone call. As we explained earlier this year, the local networks have each year been increasing the wholesale price they charge to let us retransmit their broadcast signal over our cable system to you, our customers. This seems unfair, since anybody with an antenna can watch these local stations for free over the air—however, the affiliates see a chance to put more money in their pockets by charging cable and satellite customers more, and so they will continue to raise their prices until we as cable companies say: “Sorry—we simply cannot afford to carry your channel anymore.” This was the case with KUTV—their demanded price raise for 2012 was more than we thought any reasonable person could bear, so we had to drop that feed. In the old days, when these networks were free to rebroadcast, the networks had a good case to make that we had to carry their channel on our lineup, because it was in the public interest. Now that they are forcing the cable communities to pay to watch their channel, this is no longer a must-carry situation. Luckily, in most areas, we also had a CBS feed from our Idaho Falls affiliate, which we could still offer our customers. We have to pay for this feed too, but it is significantly less than what the Salt Lake affiliate was demanding. So, we wondered if you our customers would be interested in saving more money by having us only offer a single feed of each big network. The compiled results of the feedback were very interesting. You have spoken with a clear voice, and given us the direction you would prefer to see us go. Do you prefer to watch the Idaho or Utah local channels? the majority of our customers, 59%, said Idaho locals. In Montpelier only, this broke down to exactly 50/50 for Idaho and Utah, and the highest response for Utah was in Paris, where 80% said they prefer Utah locals. When we asked What is your absolute favorite local channel to watch? The reason why people said they watched their favorite channel was clearly Local News (48%) with Broadcast network shows (eg: CSI, VOICE, American Idol etc) coming in second at 31%. The question we were most interested in was “If you could save money on your TV bill, would you prefer us to only provide a single affiliate feed of each of the networks?” The results were split at 50% for and 50% against. For further clarity, we asked “If, in order to save money on your bill, we have to drop the Salt Lake affiliates, would you still want to proceed with this?” and 59% said “No- I would prefer to pay the full re-transmission fee of $4.50 to keep the Salt Lake affiliate feed.” We also especially had a lot of people without internet service write in and ask us to not drop any of the feeds because they like to watch both the Idaho and Utah channels. 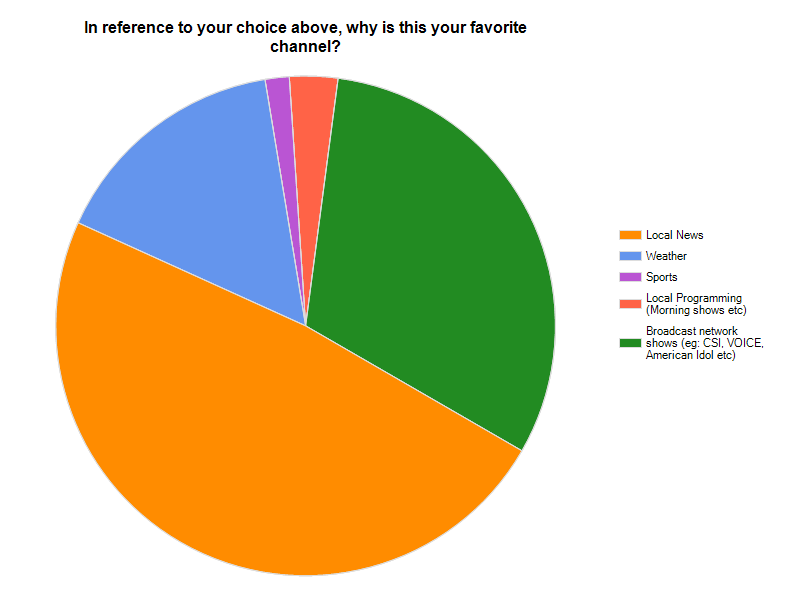 We also wanted to see a relative comparison of how important each local channel was to our customers, and the results of that closely mirrored the results of “What is your absolute favorite local channel to watch?” What we were looking for here was if there were any channels that people would prefer to drop rather than continue to pay for. Once again, the CW and KJZZ fared poorly, as well as the salt lake ABC feed. From the results, these would probably be the only good candidates to drop from our lineup; however, not surprisingly, these also happen to be the least expensive to carry (true market economics at work) and we would probably not save enough money to make it worth angering the customers who do enjoy those channels. However, these results from real customers do provide us with a good bargaining tools for next year when affiliates like the KTVX (ABC in Salt Lake) want to raise their prices again—we can show that they are simply not very popular relative to other channels in our market. We also had several comments and letters asking for Channel 2 to be brought back, no matter what the cost was, which we are taking into consideration. At the end of the day, what we heard from this survey was that our customers enjoy watching both the Idaho and Utah locals, and are willing to pay the retransmission fees associated with carrying these channels, because they are all extremely important, mostly as a way of staying connected with the community live in, and people living in southeast Idaho clearly feel connected to both the Salt Lake City and Idaho markets. So, unless something else changes significantly, we will continue to provide both the Idaho and Utah locals, and unfortunately both you, and we as a company, will have to ride out these annual local retransmission fee increases as best we can. Thank you for choosing Direct Communications. We appreciate your business, and hope you will continue to enjoy your cable TV service. We will always do our best to provide quality programming that our customers will really watch, with less fluff and filler channels that people shouldn’t have to pay for. You can feel confident that our quality line-up is still absolutely a better value than any satellite provider. You have the call signs or channel numbers for Fox mixed up. Salt Lake is 13 KSTU.